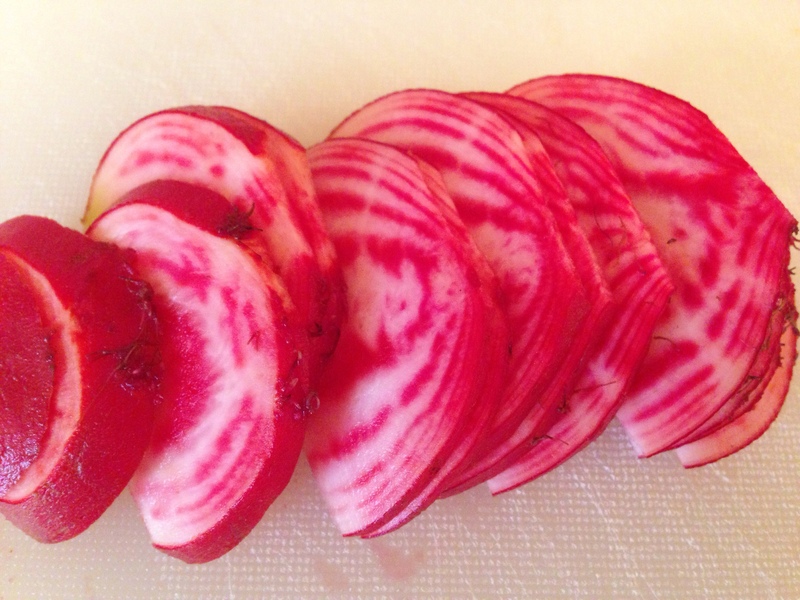 Hellbent Living | Devilishly good tips, recipes and products for the healthy you. Remember that famous Seinfeld episode with the Soup Nazi? Well, he really did exist and when I was working for Hearst Magazines on West 57th Street back in the late 80’s/early 90’s I would often wait on the long lines in the bitter cold on West 55th Street waiting for his outstanding soups, which were accompanied by bread and butter and a side of fruit. His were not your typical soups. While he did have chicken noodle and other traditional soups, he also served hearty meal dishes-turned soup like Eggplant Parmesan soup. And yes, he was curt, and if you took to long to order when your turn finally came, you did see his brusque demeanor. Regardless, it was well worth the wait. With the Soup Nazi as my inspiration, I created my own version of this soup that satisfies my craving for eggplant parmesan and my need to watch my diet. 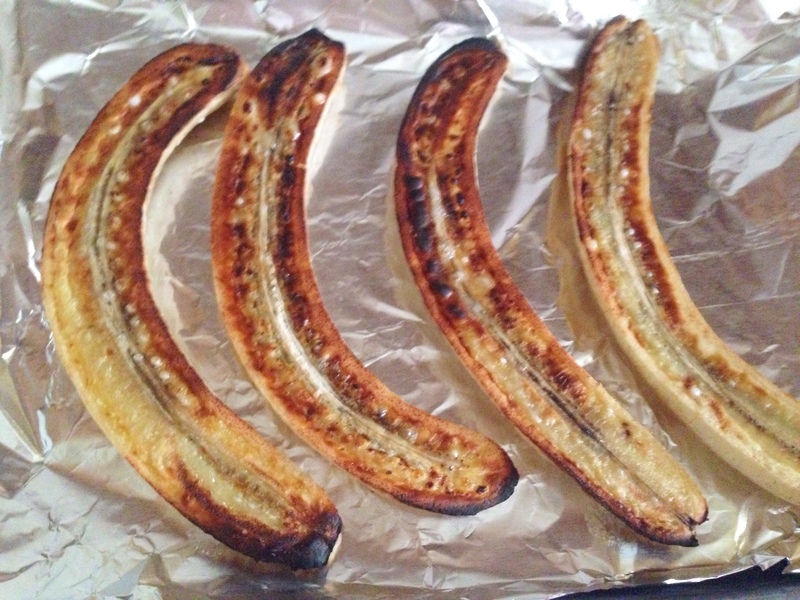 To prepare the eggplant, slice the eggplants cross wise about 1/2″ thickness then cut each round into 1/2″ dice. 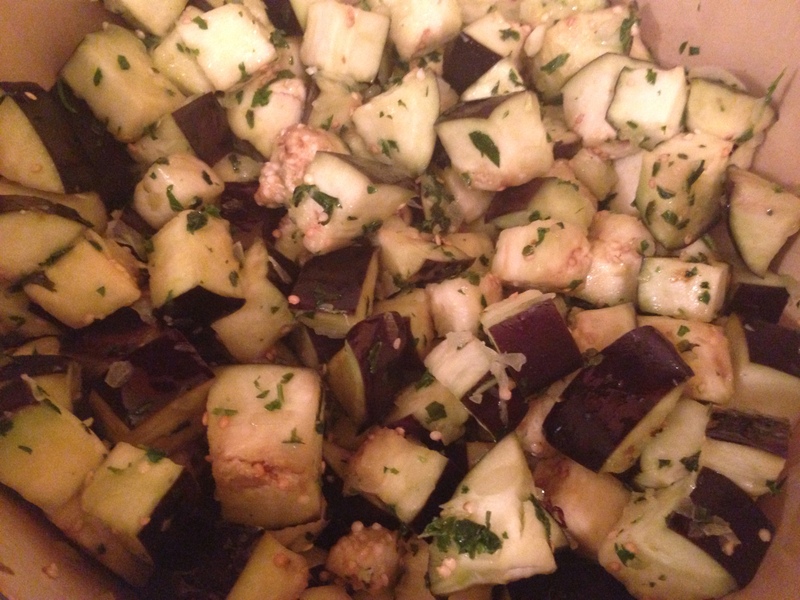 Add diced eggplant, sprinkled with salt to a colander and let sit for about an hour. This will help take out the bitterness of the eggplant and remove some of the water in the process. When the eggplant is ready, add onion, parsley, basil and garlic into the base of a food processor and process until fine. Heat oil in heavy pot, add onion herb mixture and sauté 3 minutes. Then dry the eggplant with paper towels to remove the excess water and add the eggplant to pot and sauté 3 more minutes. 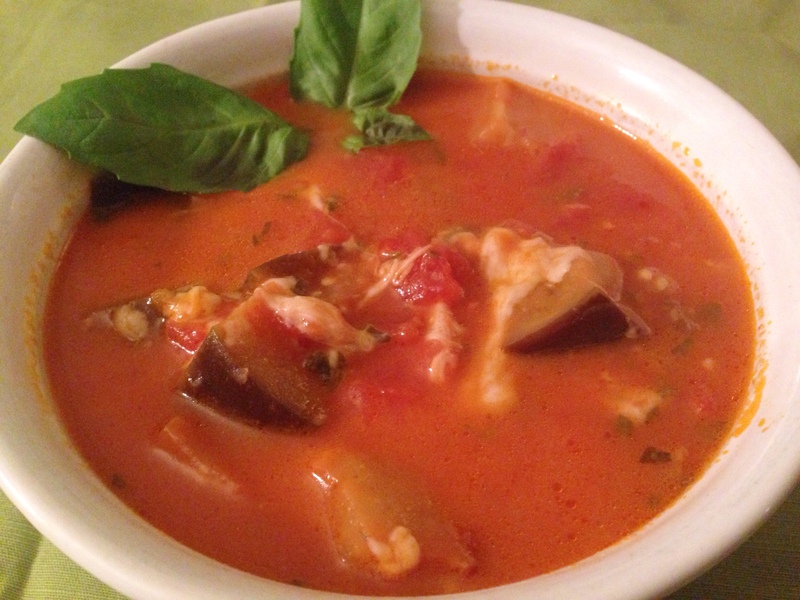 Canned San Marzano tomatoes blend with low sodium chicken broth to make the base of this soup. You can easily substitute vegetable broth for vegetarian dish. I use chicken broth because I like the flavor more. When adding the tomatoes, cut them cross-wise in thirds using a knife to help break them down into smaller pieces when cooking. After you add the broth and tomatoes to the pot, add the parmesan cheese rind, bay leaves, crushed red paper flakes, and remaining salt. Simmer the soup, covered, for 30 minutes. 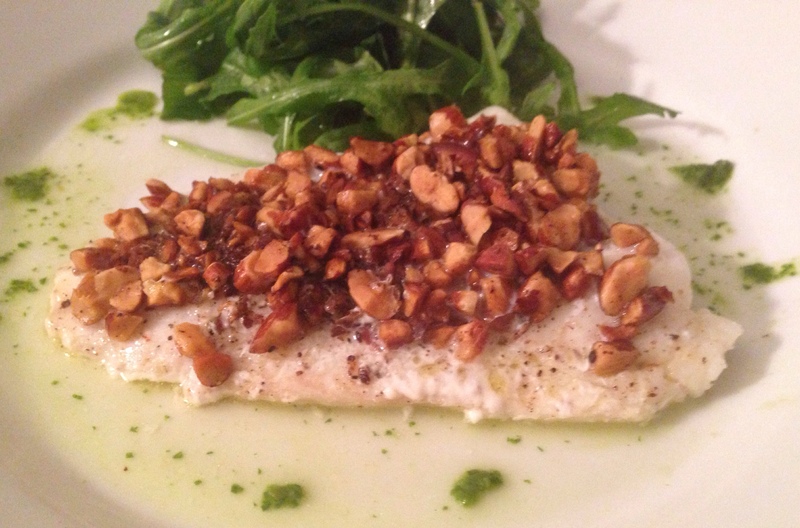 Really fresh mozzarella cheese is key for making this dish come together. You can buy fresh mozzarella in any grocery store; the best ones come with some liquid in the packaging. 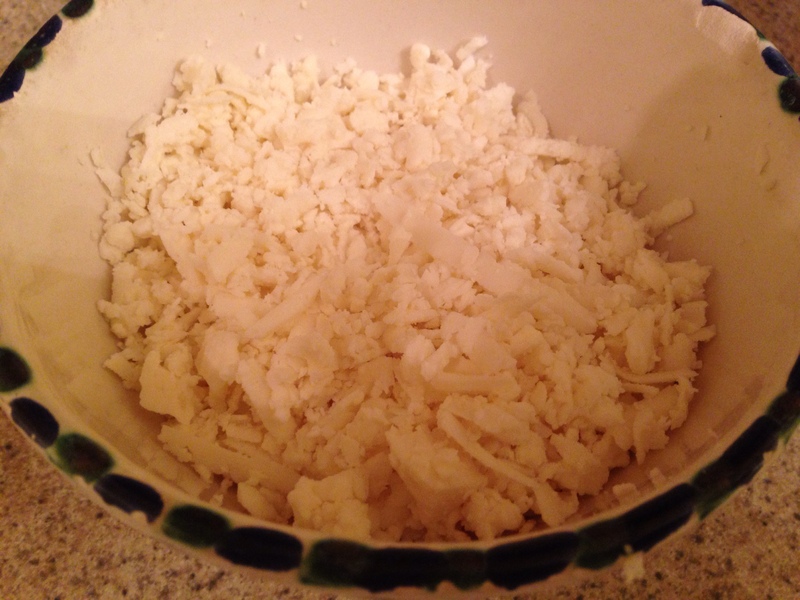 Dice the parmesan cheese into ¼” pieces and when the soup is ready, drop the pieces of mozzarella separately into the simmering broth to keep it all from clumping together. 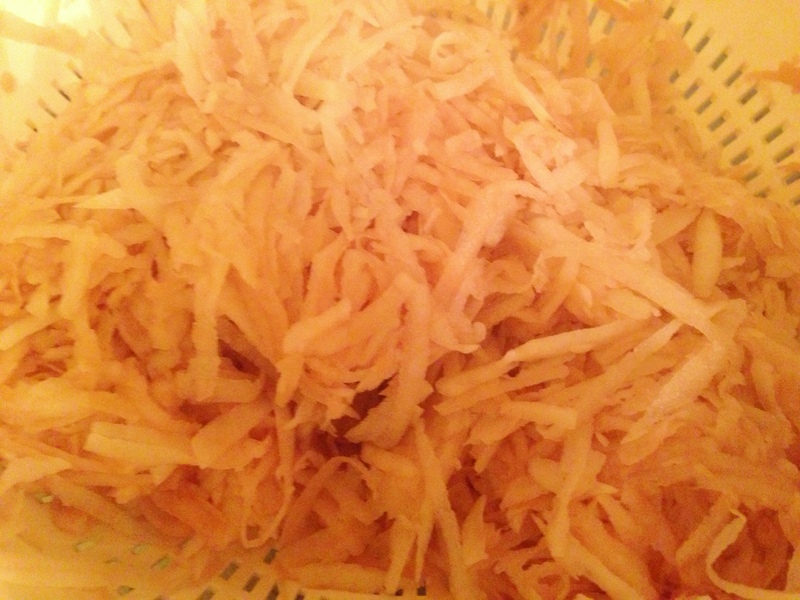 Some of the pieces of cheese will clump together so use a spoon to mix it through and separate the cheese as best as you can. Let it simmer for 3 minutes and discard the bay leaves and cheese rind before serving. 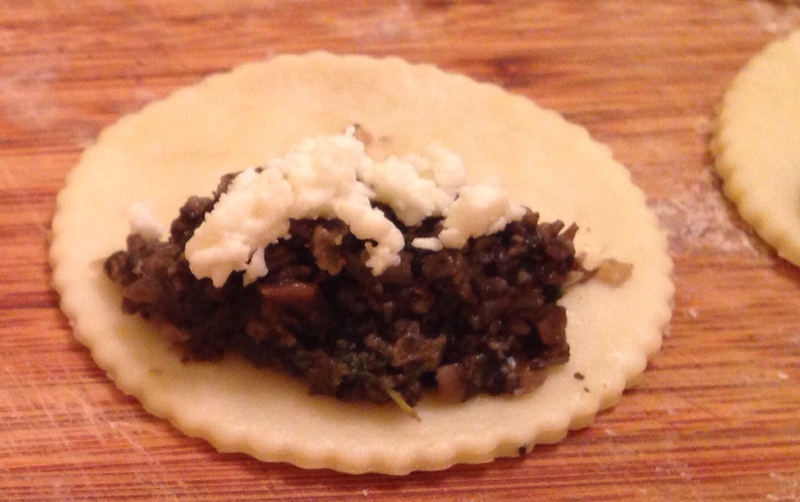 Garnish with chopped basil. 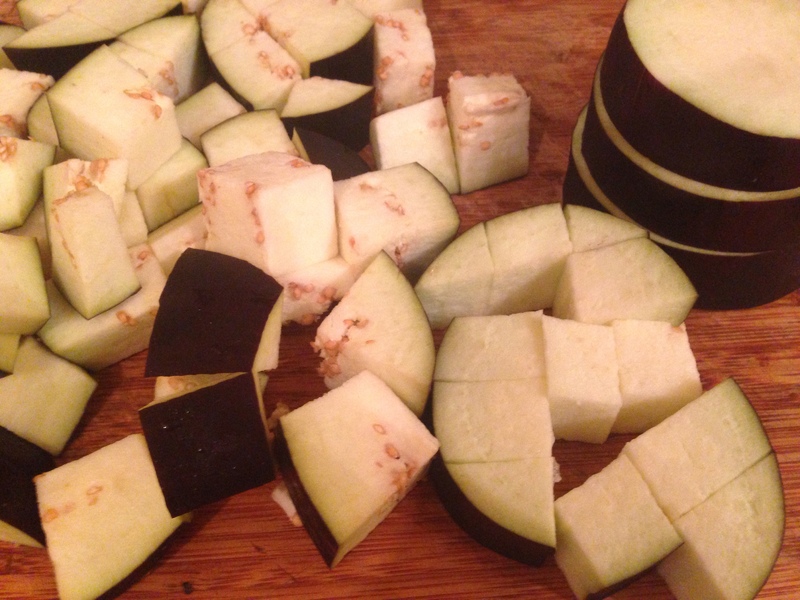 Cut eggplants cross wise about 1/2″ thickness then cut each round into 1/2″ dice. Put diced eggplant into a colander, sprinkling with kosher salt using about 1/2-3/4 tablespoon of salt, and let sit for about an hour. Wipe moisture off eggplant using paper towels. 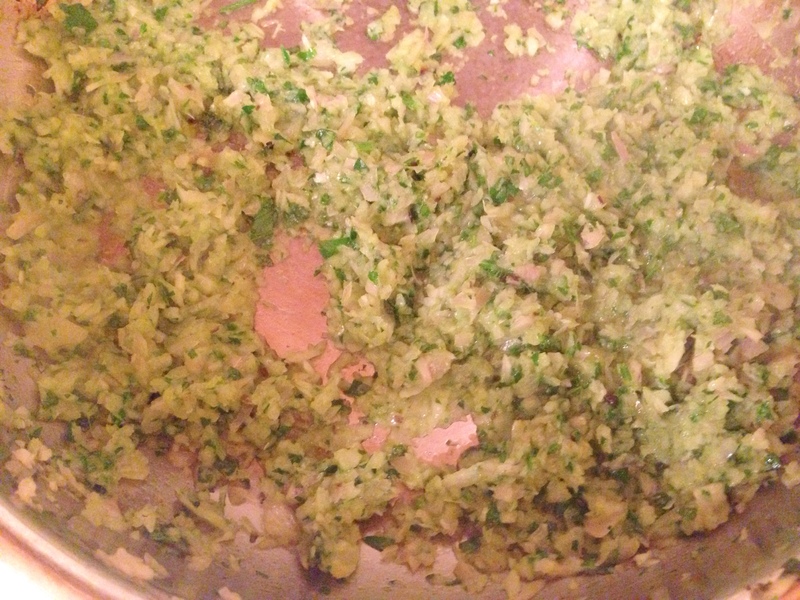 In a processor, add onion, parsley, basil and garlic and process until fine. 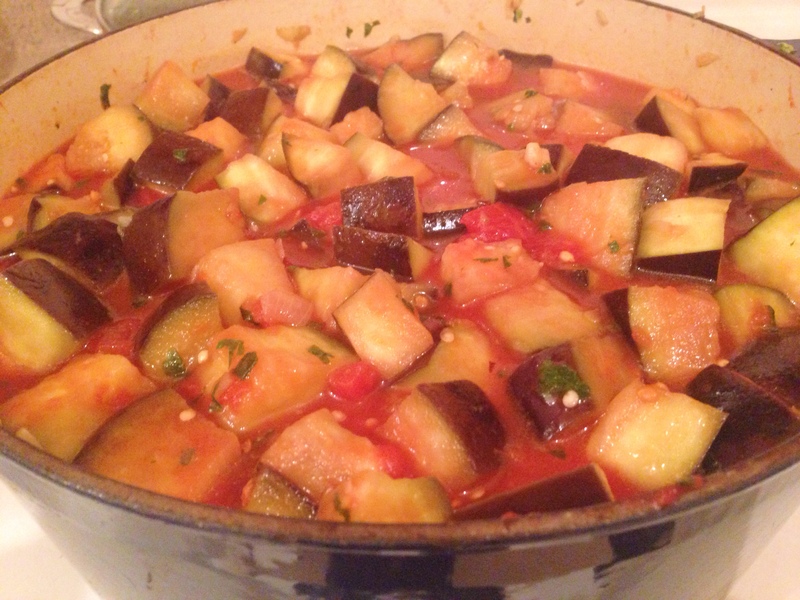 Heat oil in heavy pot, add onion herb mixture and sauté 3 minutes, add eggplant and sauté 3 more minutes. 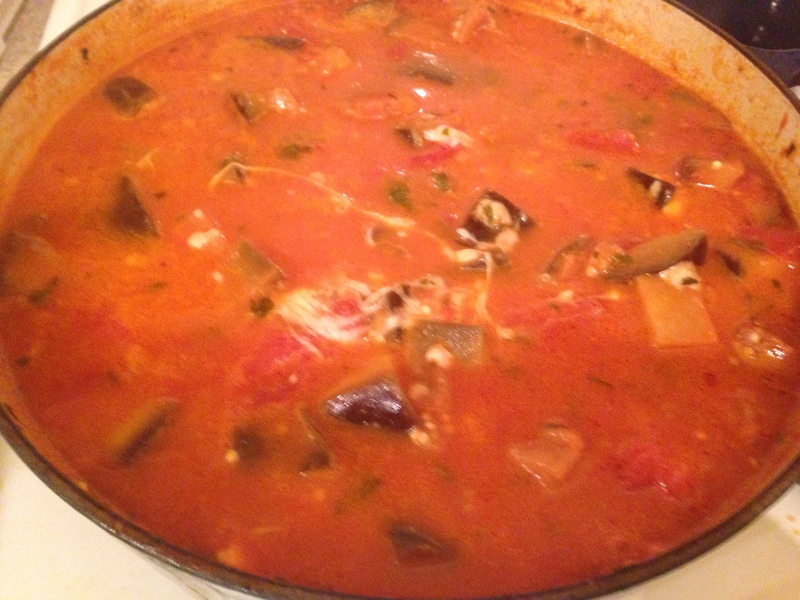 Add tomatoes, stock, crushed red paper flakes, salt, and rind, and bring to simmer, cover and simmer 30 minutes. Dice mozzarella into 1/4” pieces and drop into simmering pot. Cook 3 minutes separating the melted cheese. 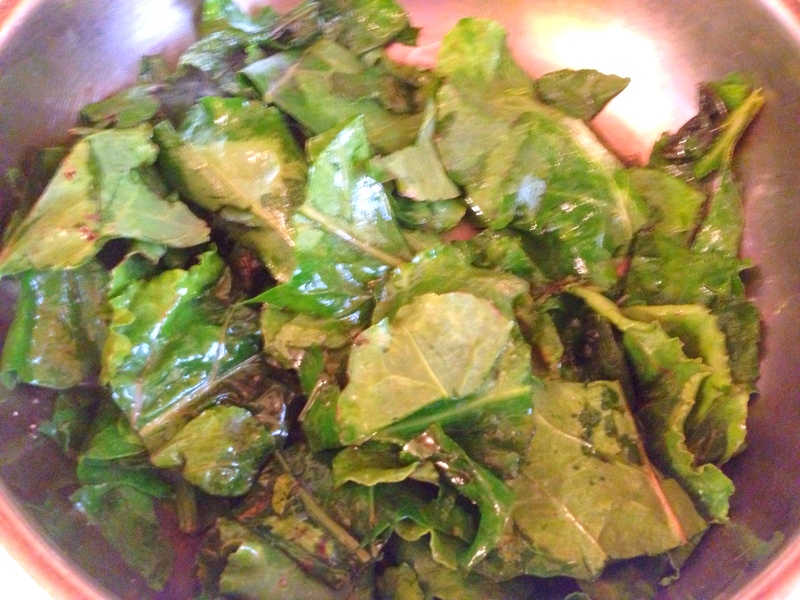 Discard bay leaves and rind and serve. Garnish with chopped basil. 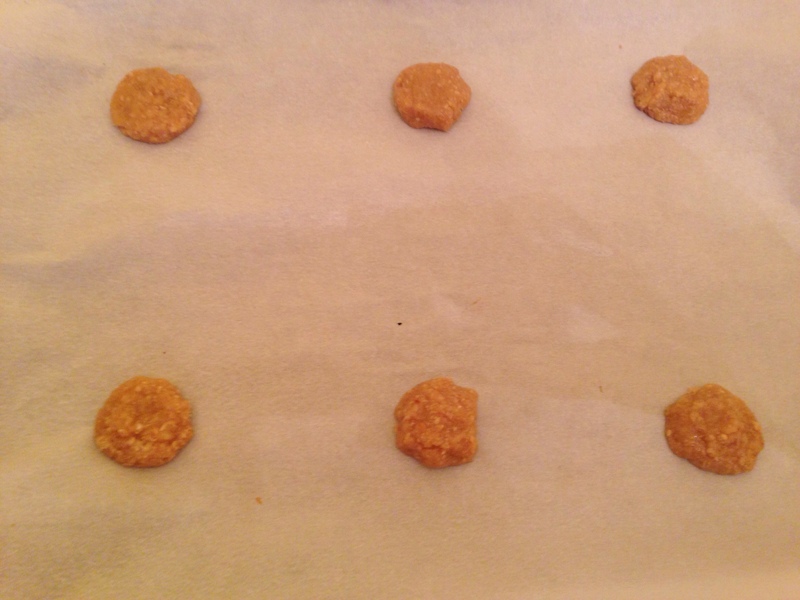 This entry was posted in Blog, Recipes on December 1, 2014 by Leslie. These baked potato pancakes with chard are a healthier version of potato latkes, as they use a fraction of the oil, are gluten-free, and are mixed with nutritional powerhouse Swiss Chard. 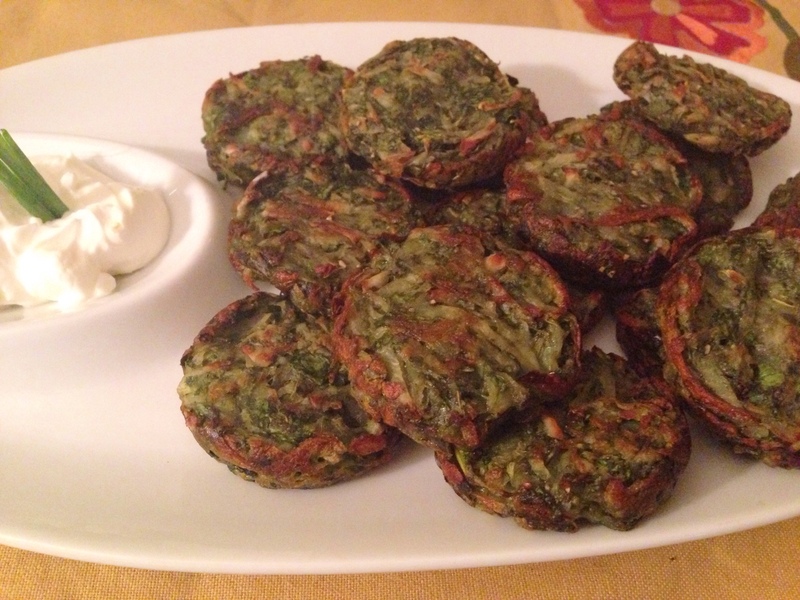 They are baked in non-stick muffin pans so the texture is not as crispy as traditional latkes. 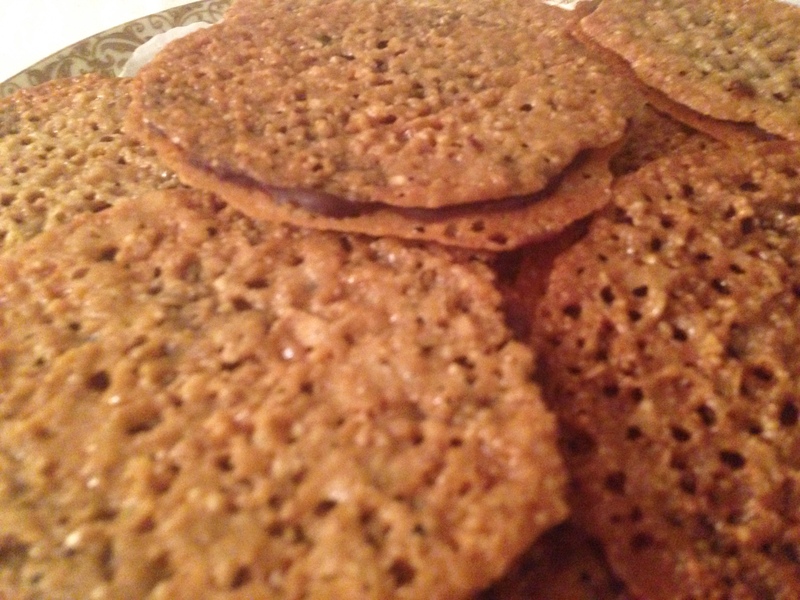 They are more dense and more like pancakes, however, they have some crispiness on the outer layer, but they are definitely softer in the inside. The flavor however is terrific, making this lower-fat version well worth it. 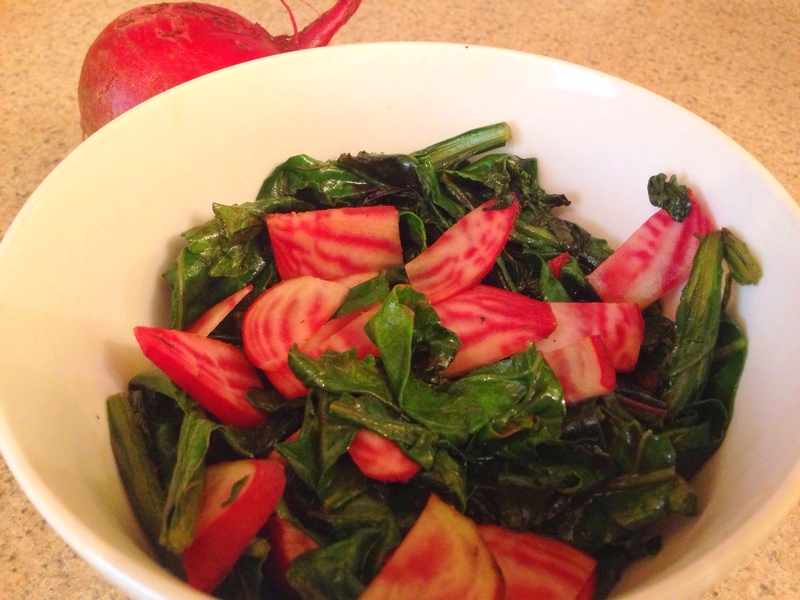 I use green chard for this recipe as I like the coloring better, but feel free to play with rainbow chard as well. The pancakes pair well with a dollop or sour cream on top. 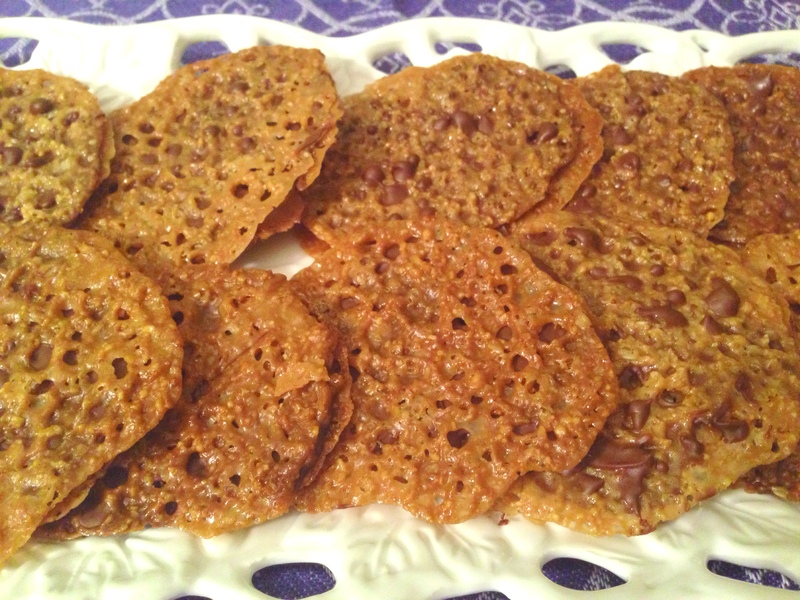 To make the pancakes, grate the potatoes – I use russet as they are starchier than other potatoes and hold up well. Make sure to drain the potatoes in a colander while you’re prepping the rest of the ingredients and squeeze the excess water using paper towels before adding the potatoes to the chard. 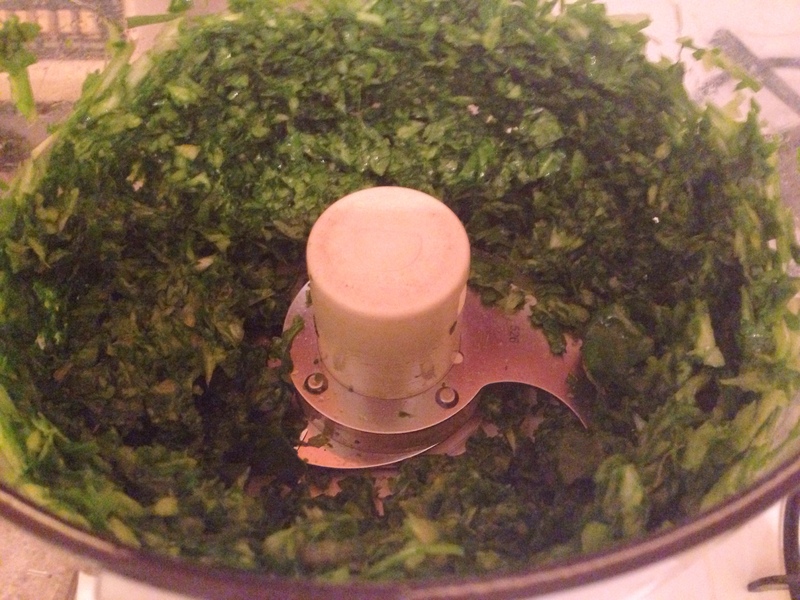 In a food processor, add the chard and scallions and process until the vegetables are finely chopped. Add them to a bowl along with the drained potatoes. 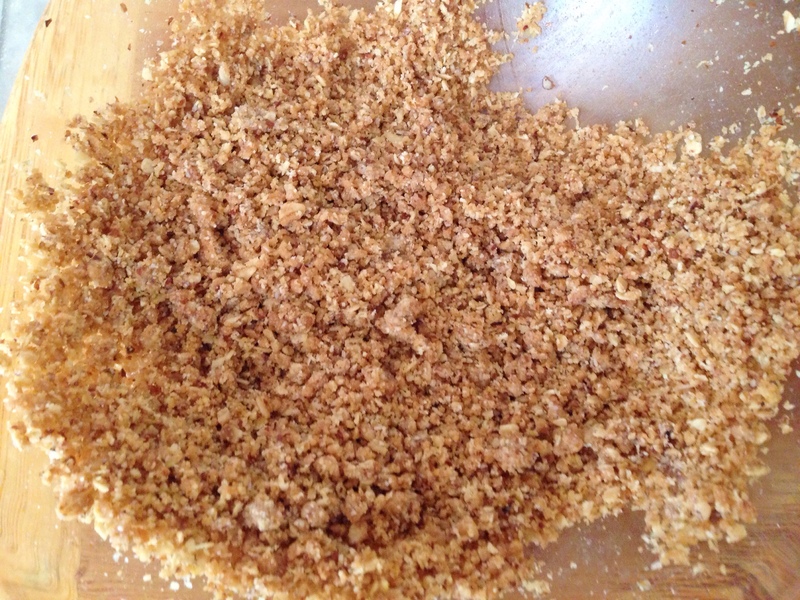 Add one egg, the potato starch, and salt and pepper to the bowl and mix through. 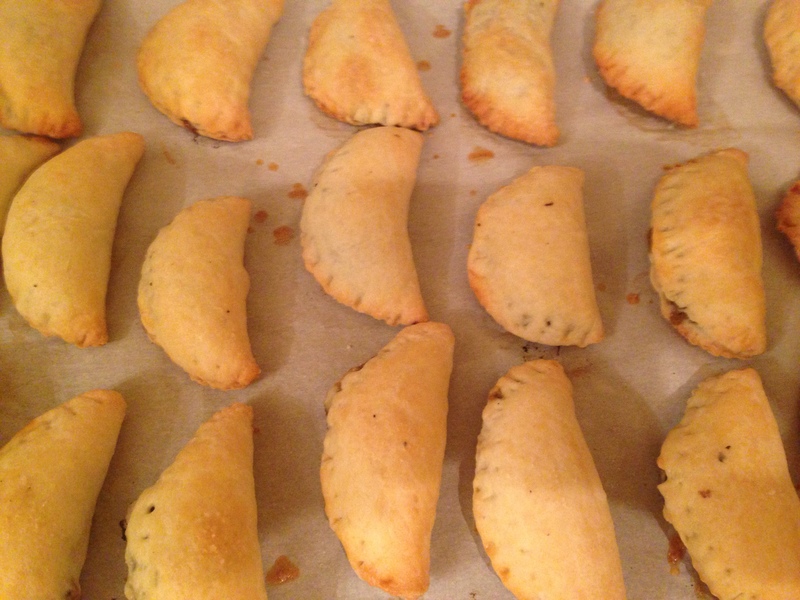 Using a pastry brush, brush the oil into the muffin tins about halfway high. Add about two tablespoons of the mixture to each muffin round and pat down.Make sure to squeeze out the excess water before adding the mixture to the muffin cups and do not over stuff, err on teh side of less than more. 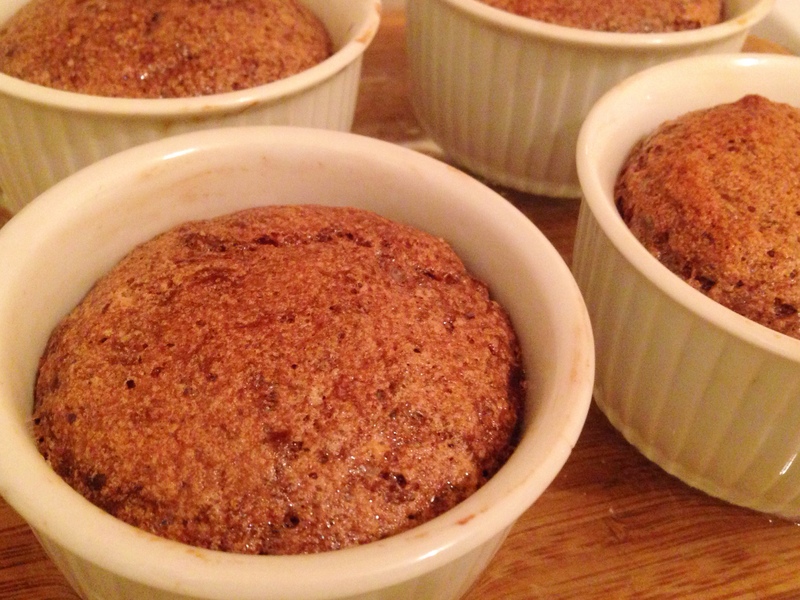 Place muffin tins into a 400° oven and cook for 10 minutes. 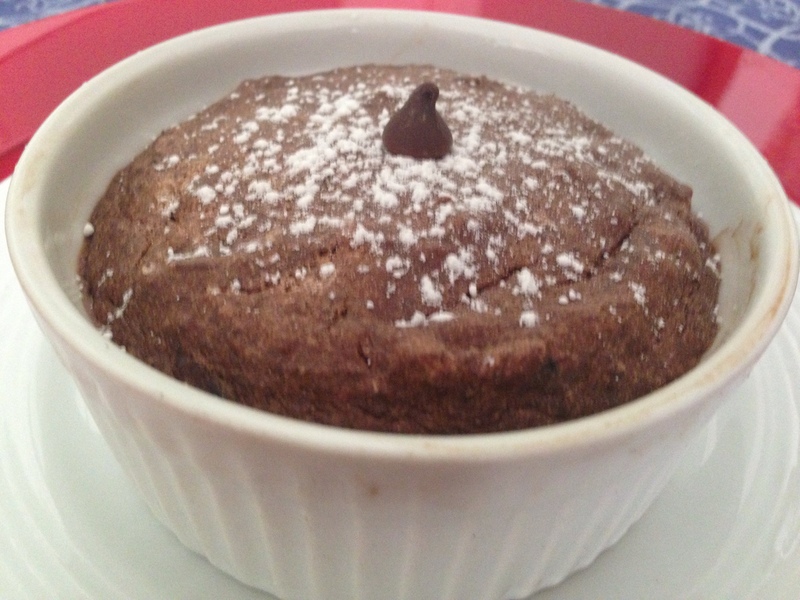 Remove muffin tins from oven and turn the pancakes over. The pancakes may stick a bit so use a knife and cut around the edges before turning. Place the muffin tins back into the oven for another 10 minutes. 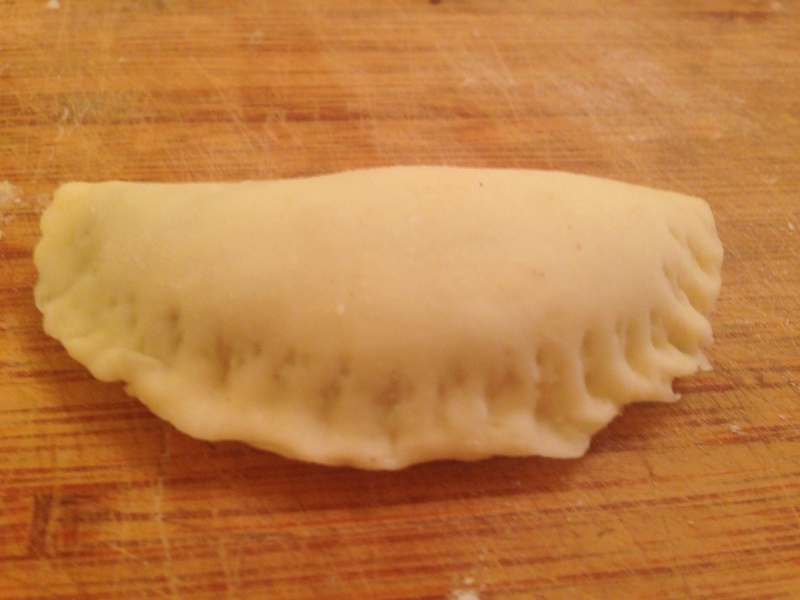 Repeat this step one more time with the last return to the oven being for only 5 minutes. 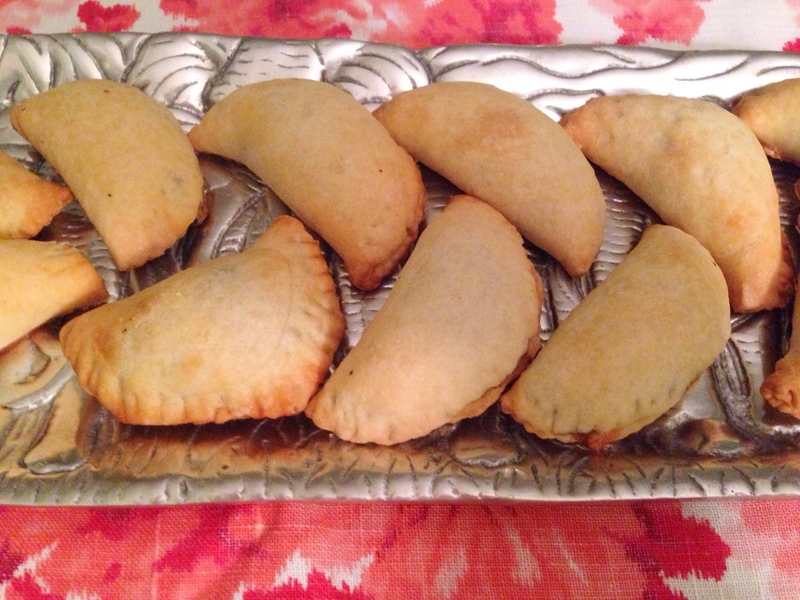 Serve with sour cream on the side. Grate the potatoes and drain the potatoes in a colander. 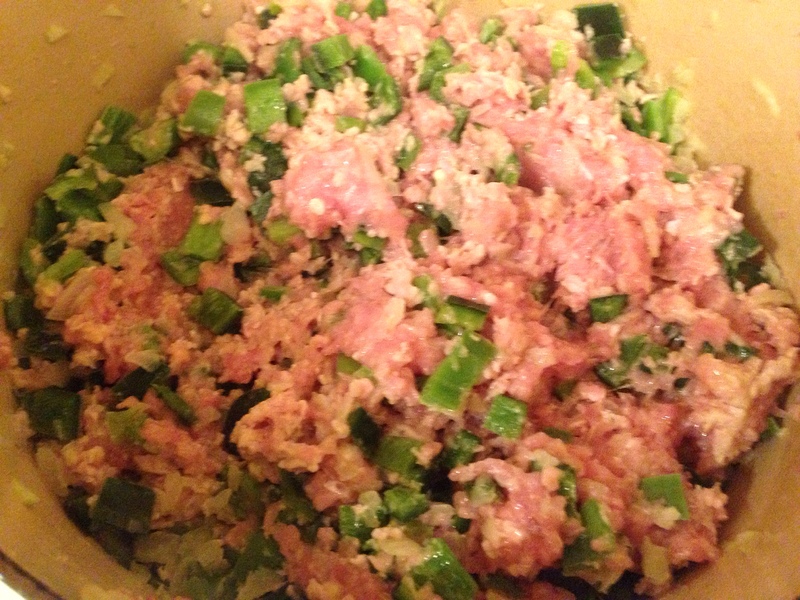 In a food processor, add the chard and scallions and process until the vegetables are finely chopped, and add them to a bowl. Squeeze the excess water out of the potatoes using paper towels and add them to the chard mixture. Add the egg, the potato starch, and salt and pepper to the bowl and mix through. 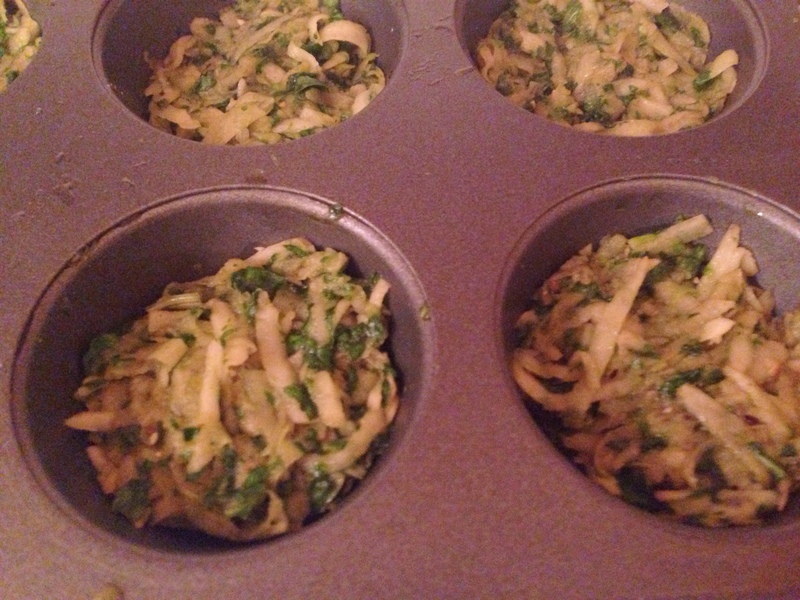 Using a pastry brush, brush the oil into the muffin tins about halfway high. 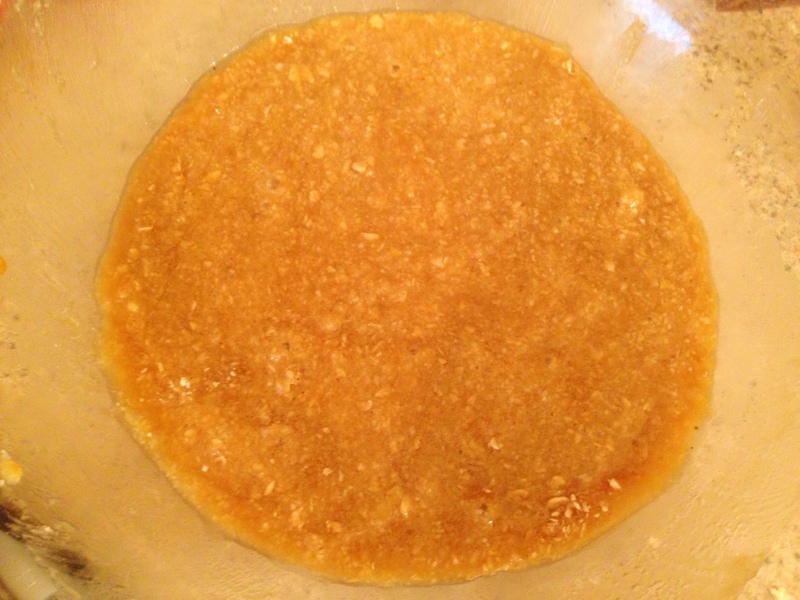 Add about two tablespoons of the mixture to each muffin round and pat down. 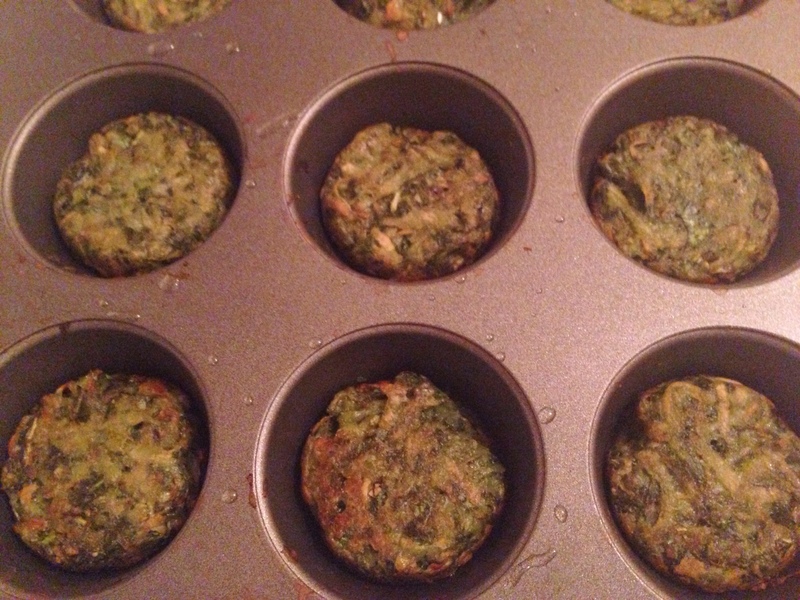 Place muffin tins into a 400° oven and cook for 10 minutes. 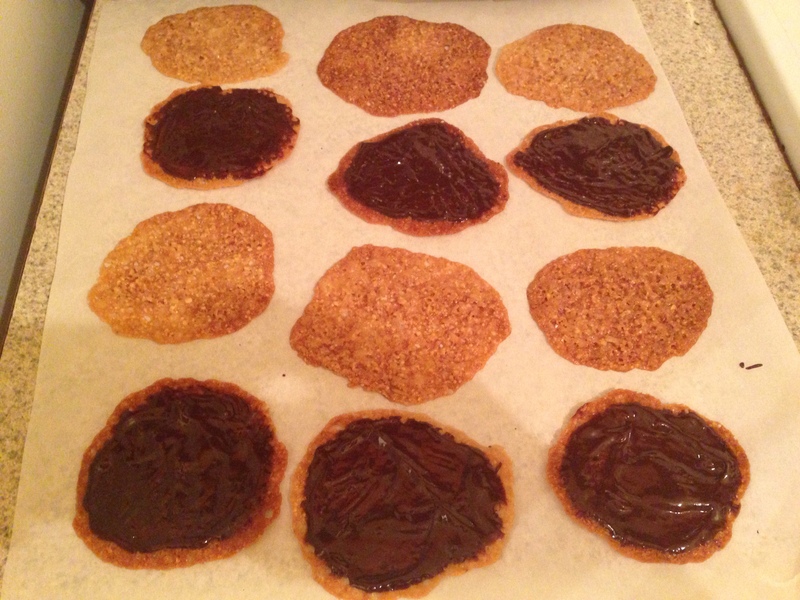 Remove muffin tines from oven and turn the pancakes over and place back into the oven for another 10 minutes. Remove the muffin tins from the oven and once again flip the pancakes and place back in the oven for the final 5 minutes. 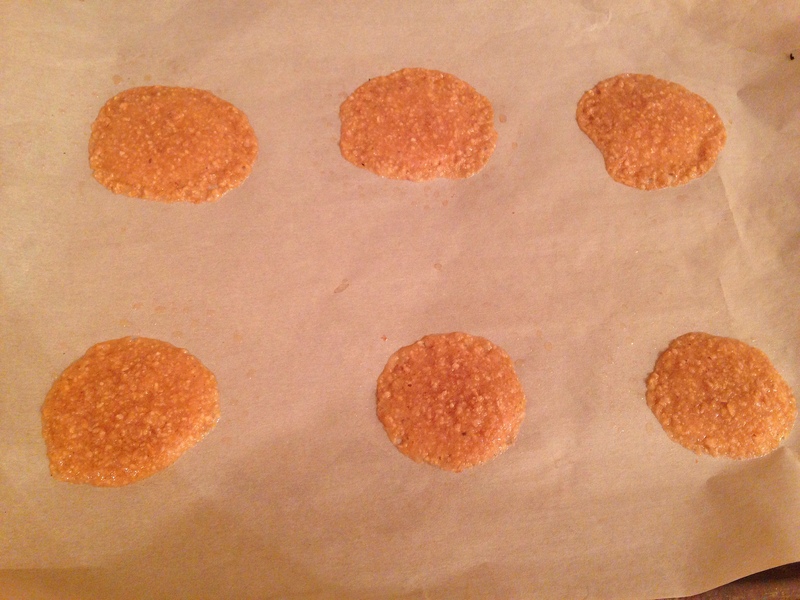 Serve with sour cream on the side. 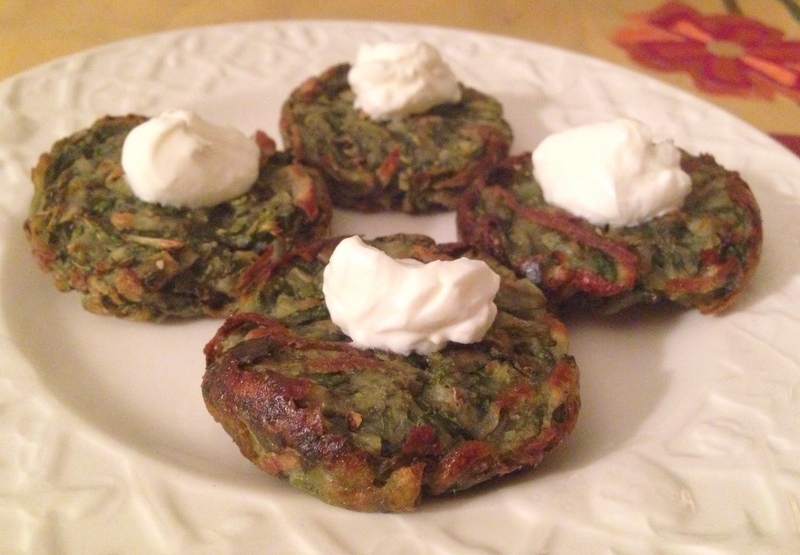 This entry was posted in Blog, Recipes and tagged Chard, Latkes, Potato Pancakes on December 1, 2014 by Leslie. 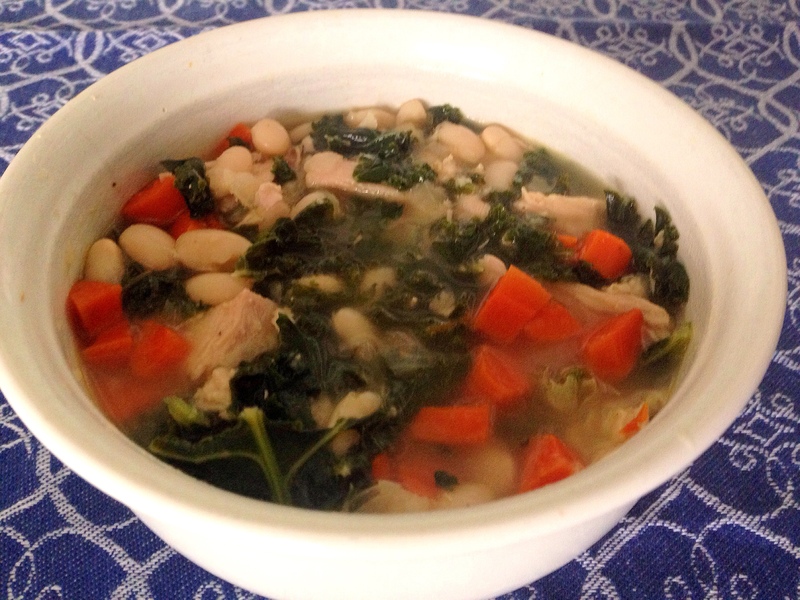 This is a great tasting soup for winter. 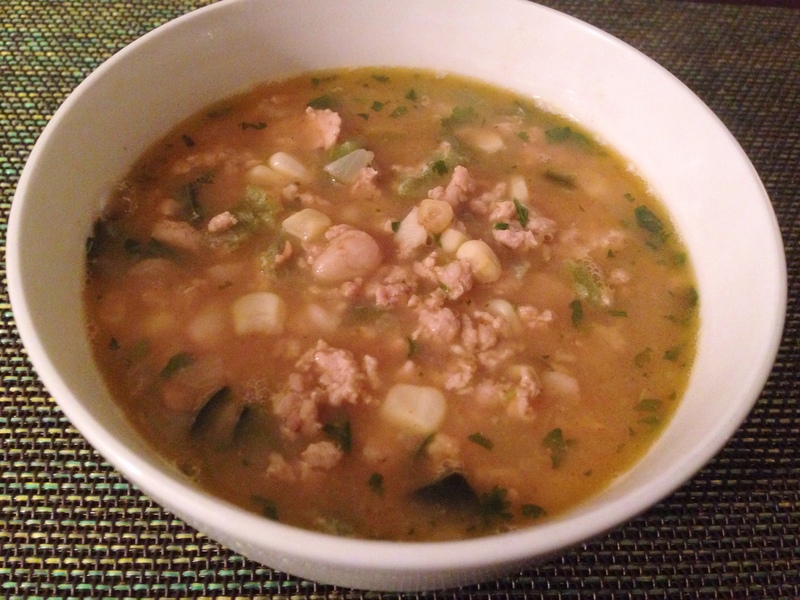 It blends a lot of great flavors and nutrition in one meal and it freezes really well so you can make it ahead and always have soup on hand to serve. This recipe calls for making the turkey stock from scratch using uncooked turkey. 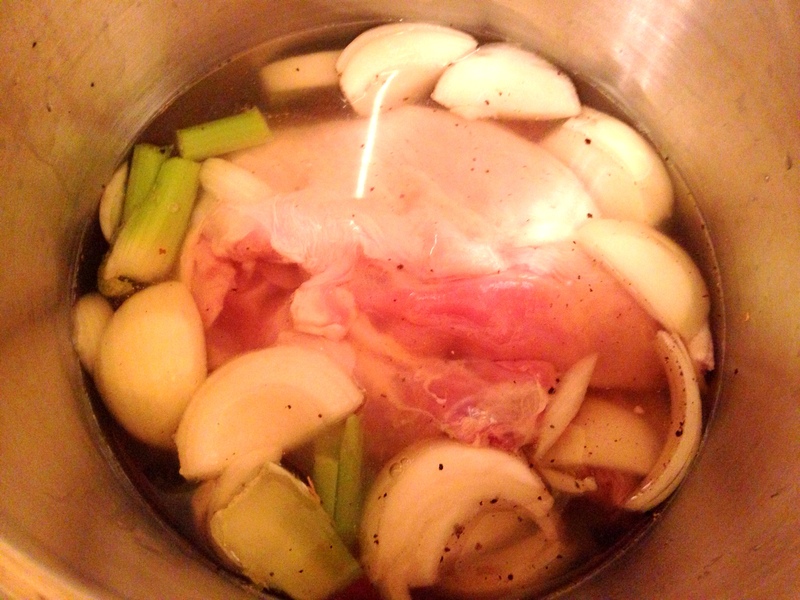 If you have a left over turkey carcass and want to make stock from that, that can work. Alternatively, you can use bought chicken stock. To make the stock, use a 2-1/4 – 2-1/2 pound half turkey breast with bone in and skin on and ask your butcher for 2 turkey necks. 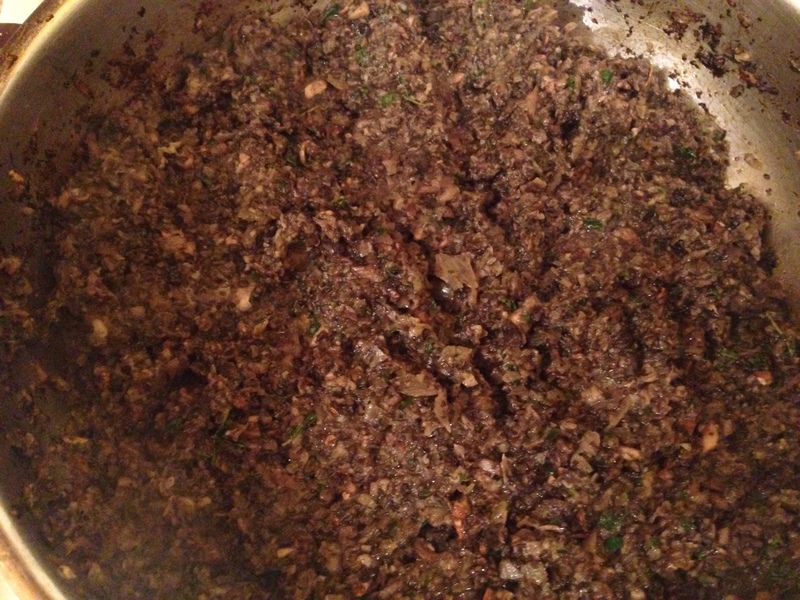 In a large stockpot, add water, onions, carrots celery salt, ground pepper and the turkey. Bring to a simmer, cover pot and let simmer for one hour. I like to make the stock one-day in advance refrigerate it and the skim off the fat before making the soup. When the stock is done, remove the turkey breast and let cool. Discard all other solids and reserve liquid. 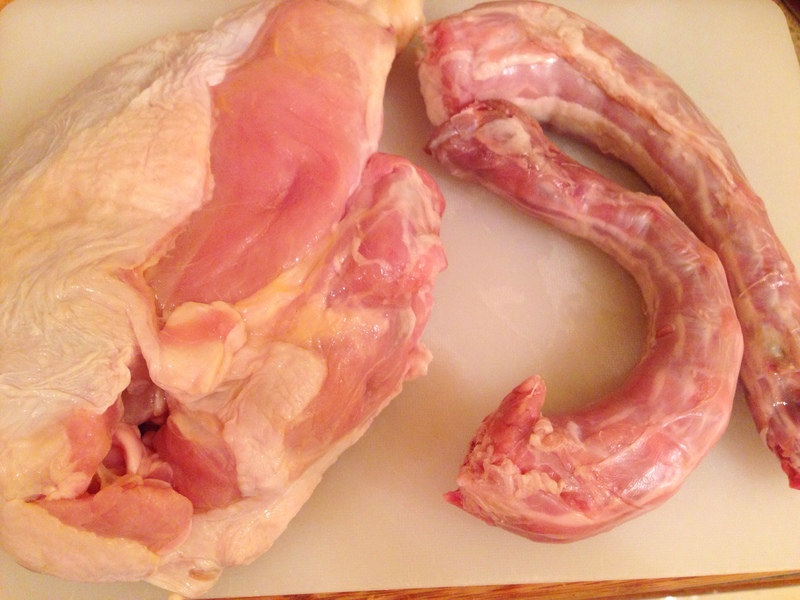 Remove the skin from the turkey breast and cut the meat into half-inch pieces Discard the skin and carcass. If you are making the stock one-day ahead reserve the cut turkey in a covered bow or storage bag until you are ready to make the soup. 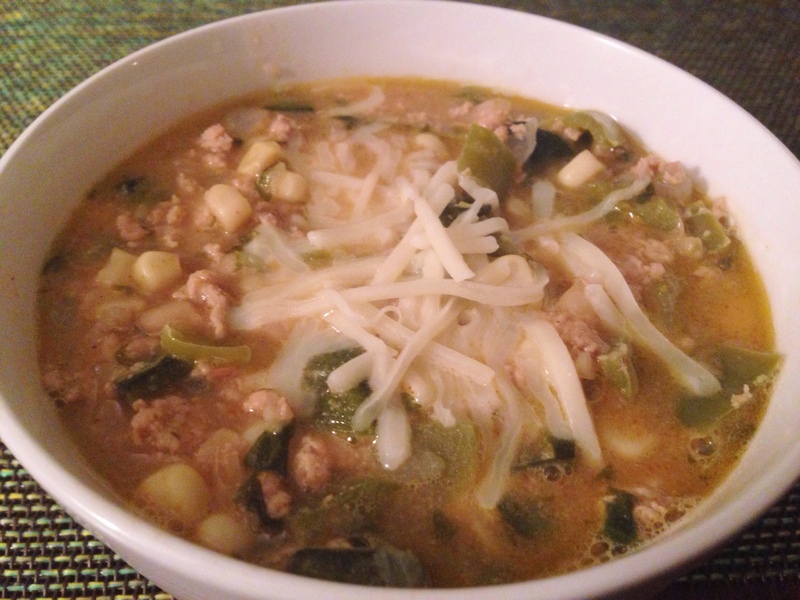 The key ingredient in this soup is the addition of a Parmesan rind that is about 3” x 2”. 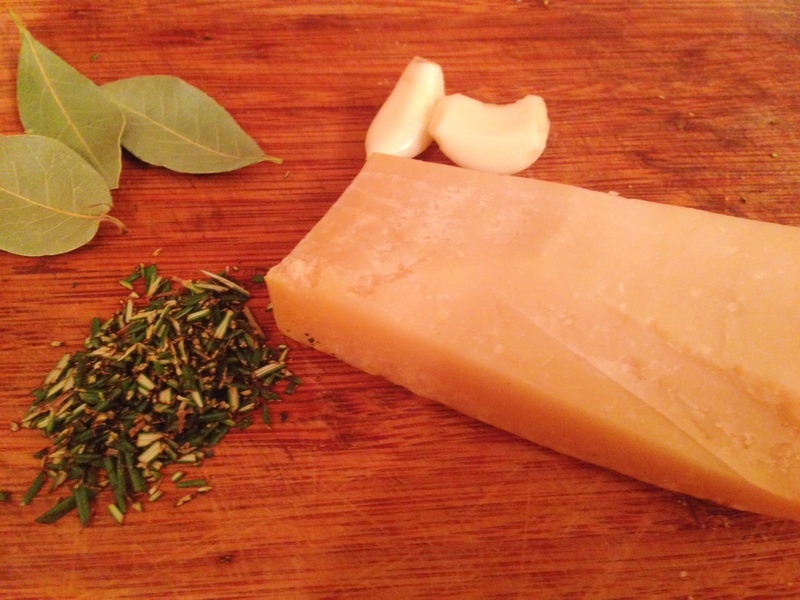 As the soup cooks the Parmesan adds a subtle, nutty flavor and depth to the soup and is well balanced by the rosemary. 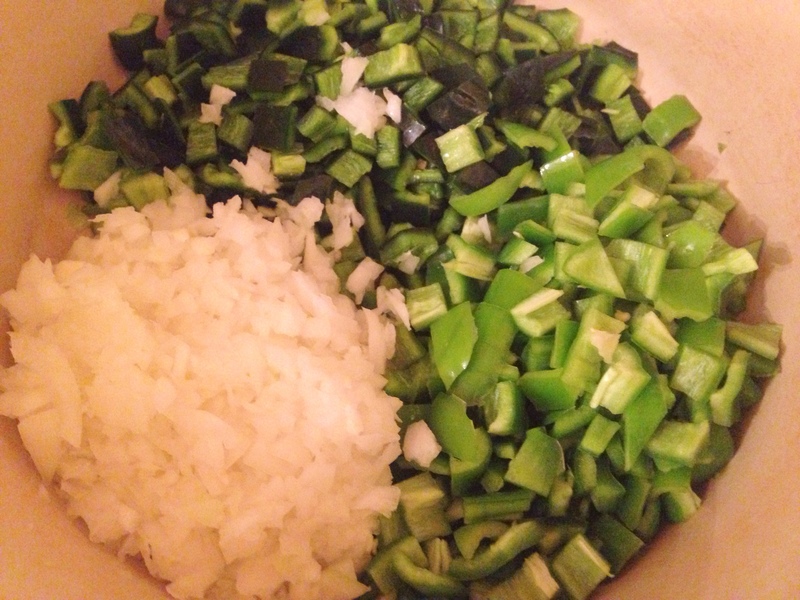 To make the soup, first prepare the beans. While the stock is cooking (or the next day prior to making the soup if you had made the stock one day in advance) add 1 cup of dried white beans to another pot and cover with water. Bring to a boil, turn off heat and let stand for one hour. Drain water and reserve beans. In the pot that was used to pre-cook the beans, add the oil, chopped onion, garlic, rosemary and sauté until the onion is soft – about 4 minutes. Add the reserved stock, beans, Parmesan rind and bay leaves and simmer covered for 50 minutes, until the beans are cooked through. Then add the kale, the diced carrots, and turkey. 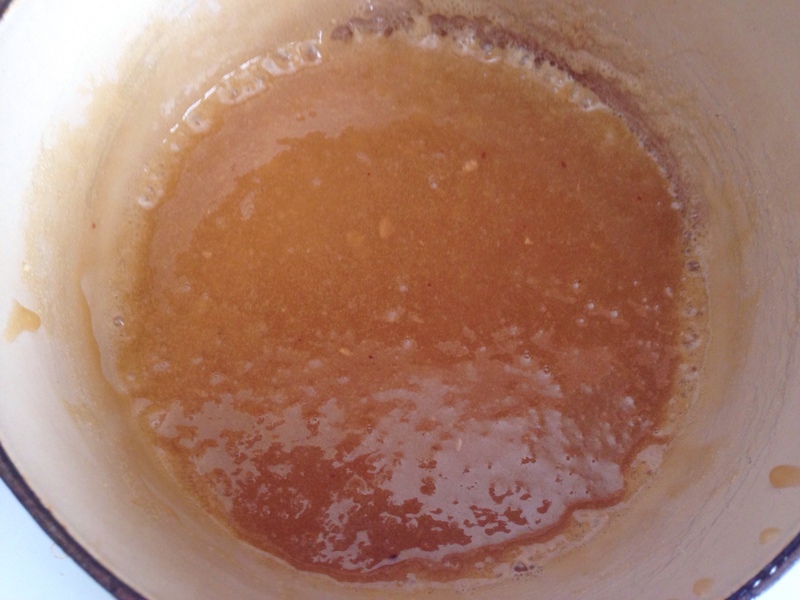 Mix through and simmer for 15-20 minutes uncovered. Discard bay leaves and Parmesan rind and serve. Prepare beans using the quick soak method by adding1 cup of dry white beans to a pot and cover with water. Bring to a boil, turn off heat and let stand for one hour. Drain water and reserve beans. 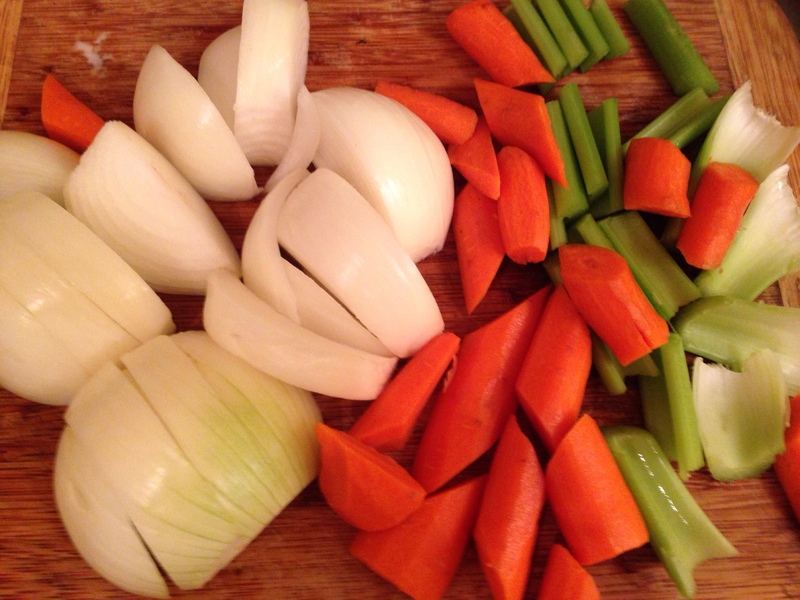 To make the soup, add the oil, chopped onion, garlic, rosemary and sauté until the onion is soft – about 4 minutes. Add the reserved stock, beans, Parmesan rind and bay leaves and simmer covered for 50 minutes, until the beans are cooked through. Then add the kale, the diced carrots, and turkey. 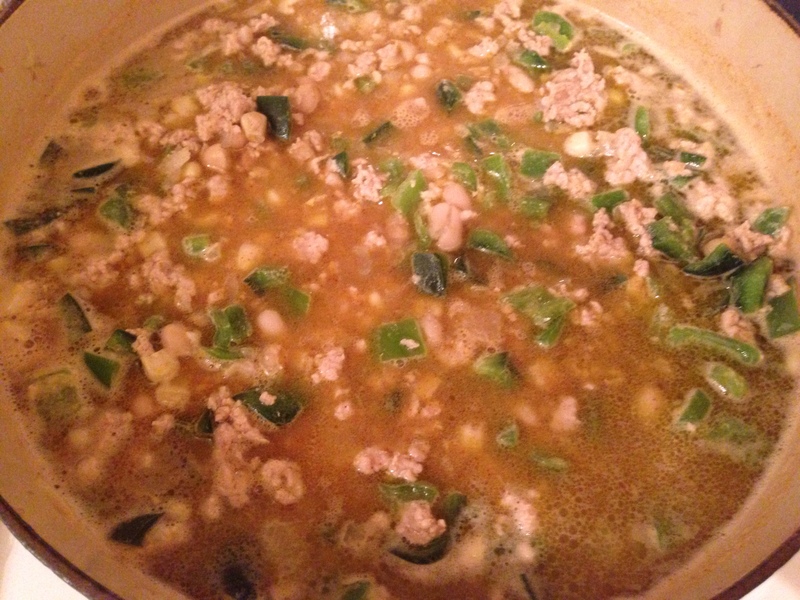 Mix through and simmer for 15-20 minutes uncovered. Discard bay leaves and Parmesan rind and serve. 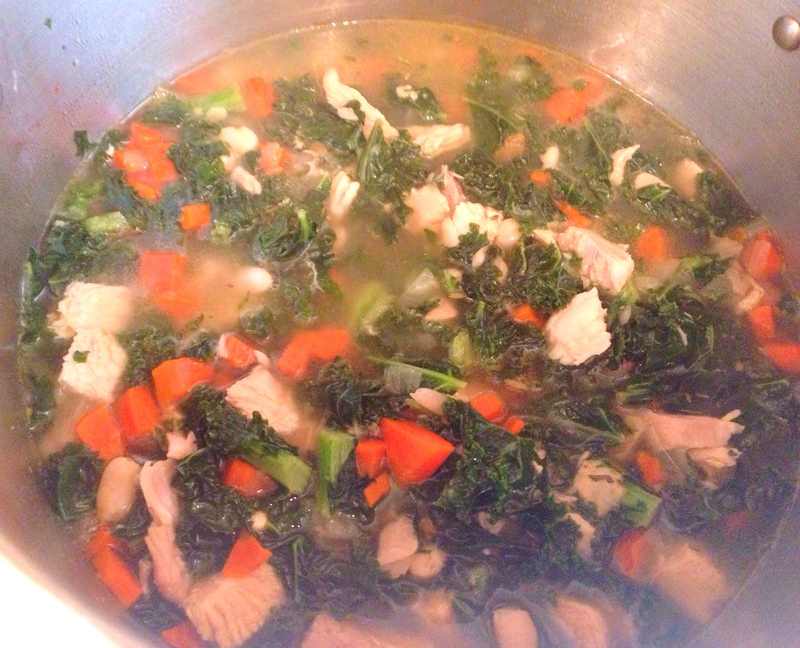 This entry was posted in Blog, Recipes and tagged Egg white, Kale, Turkey Soup on November 1, 2014 by Leslie.